The Burberry Prorsum poncho/cape from the Fall 2014 runway show is the most covetable item of this season. It is a must-have right now for every fashionista in the spotlight. 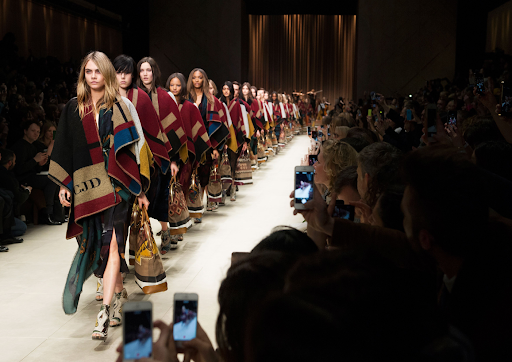 Burberry's monogrammed cape first made a splash when it debuted on Cara Delevingne during the show. The global-luxe garment is inspired by traditional equestrian blankets and crafted in a sumptuously soft blend of wool and cashmere (85%/15%), making it the perfect layering piece or coat replacement. Cape features a new interpretation of the classic check pattern and is crafter in Scotland. The brand is known for its trench coats is officially in the poncho game, it girls and fashion lovers alike are all wrapped up in it. The British heritage brand will roll out the personalisation service on not just the cape, but on their entire range of heritage scarves. For an additional cost of £200, up to three letters can by added onto the accessories. The poncho measures 130 x 127cm/51.2 x 50in and is finished with blanket stitch edges.